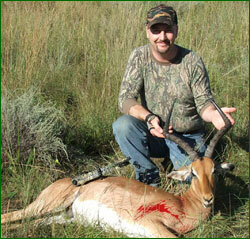 Virtually all bowhunting in Africa happens during the dry, winter months. 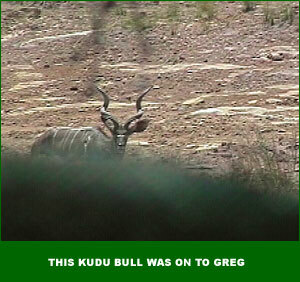 Blinds are constructed next to watering holes and bowhunters wait patiently, dreaming of a big 55" kudu bull to walk in and drink. The shot is made and the proud bowhunter brings home a magnificent animal - or more likely, several magnificent animals. There is no doubt that for the bowhunter looking for high success, this is the way to do it. In fact, many bowhunting operations only provide dry season hunts. But there are a few ranches open to a different option - green season bowhunts. Perhaps the better way of putting it would be they allow you to hunt your way - including stalking animals, building your own blinds, setting up ambush spots, etc. The hunt becomes more personal and satisfying for those hunters who want to take a more active role in the hunt. This is not to take away from the dry season hunts at waterholes - you will see more game and enjoy more success during that time of year. 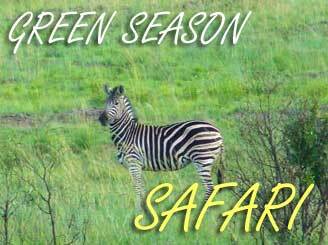 But for the adventurous bowhunter - a green season bowhunt may be the way to go - especially if the experience is more important than the trophy. Two experienced bowhunters traveled to South Africa to experience such a hunt. Greg Hammell and Mike Seekins accepted the challenge and along with Mike's wife Sherry, and Greg's son Nicholas - they flew to South Africa and were met by Buchholz Safaris' owner Chris Van Schalkwyk , and his PH Wiehan Buchholz. The hunt details were simple - they could hunt their way for 6 days - including waterholes, baited sites, stalking, ambushing at trail crossings, drives - whatever they wanted. It was their hunt to do as they pleased. The rest of the story is an account of their experience. Buchholz Safaris - with two properties (1 bowhunting only) in the Limpopo Province of South Africa, Buchholz provides a comfortable, intimate african bowhunting experience. They want you to hunt your way and will accommodate virtually any hunting method you choose. Buchholz caters to the family. They have an outstanding Father/Son package available. Check them out online at www.buchholzsafaris.com. I arrived in the tree hide before dawn. Shortly after sunrise a group of five zebra came into sight. The stallion was in the lead, followed by a pregnant mare and three other adult mares. They were too far for a shot, however, it was an opportunity to learn a little about their movement and behavior. Eventually some impalas joined them, as well as blesbok The grass was green so I started to wonder why they'd want this mineral lick under my tree? It was obvious, I'd have to go to them. After lunch we all decided to stalk for the afternoon hunt. Wiehan and Greg went after wildebeest and I decided to stalk anything that gave me an opportunity. 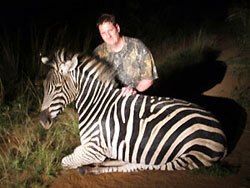 The zebra showed up again so off I went into the fields, crawling on my hands and knees - and at times - on my stomach. But there were just too many eyes and after a good effort, they spooked and left the area. 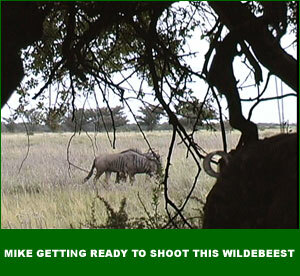 I then set my sights on the next animal - a blue wildebeest right at tree line. It was a single, good bull, but the best part was there was just one set of eyes! I slowly moved while he grazed in the tall grass - over four feet tall!. I worked around a small group of trees and didn’t realize he had doubled back behind me. I had to laugh. I wasn’t stalking anything for the last five minutes. I headed toward the wildebeest. He had hooked up with five zebra, some blesbok and more wildebeest. The wind was in my favor and they weren’t too far out into the field. Things were looking good. I took my time and concentrated on every step closer. I got to within forty-five yards but the wind began to swirl. I backed off and let the animals move further into the field. I had a few more quick stalks in the early evening before calling it a night. I did notice how most of the animals would graze in the fields in the evenings. I learned a lot today. I'm starting to figure out a strategy which may get me closer tomorrow. Monday morning we went to the Cemetery Hide. We chose this hide because it had the best vantage perspective for filming animals. Nothing came in and nothing could be seen in the distance. After 5 hours, we radioed Chris to regroup. When Chris picked us up we glassed the surrounding area and spotted a small herd of wildebeest and blesbok - several hundred yards behind us. We would attempt a "walk and stalk", as he called it, after breakfast. Seeing that the herd had not moved far, Wiehan and I snuck alongside a patch of Eucalyptus trees. Once through, we dropped to the ground and proceeded to crawl towards the wildebeest. Nick stayed back with the camera. For an hour and a half, Wiehan and I crawled toward a large bull acting as a sentry. The bull spotted our movement in the grass. I remembered a trick that Chris had mentioned which was to move your arm up over the Veldt grass and then bring it down. He said that wildebeest are very curious and would likely walk toward the movement. Not knowing what to expect, I tried it, and to my surprise it worked. The bull was now within 50 yards. I crawled a bit further in the long grass toward an ant hill which would provide me some cover. Once there, I found the wind was good but I was exposed to the rest of the herd. Hearing and feeling the pounding of 30-35 wildebeest through the field was pretty damn cool - even if I did not get a shot. We stalked this herd 2 more times to no avail. Wiehan suggested we explore the backside of the mountain with the hopes of locating a Kudu. We found them on the rocky mountainside but not before they spotted us and trailed away. They, along with the zebra, seem to be the keenest animals on the property. We drove back by starlight. I decided to hunt the same tree hide as yesterday. Once again, the zebra and impalas were grazing in front of me. I waited all morning for them to come into the tree hide. I finally called the morning hunt. It was time to change tactics. For two days I had been looking at this field and seeing animals - it was time to move toward them. There were several clumps of trees which would be perfect natural hides. I had to make some changes to the setup (fine tune it a bit) but before long I was settled in. By late afternoon, the impalas, along with a family group of five zebra were grazing the field just like this morning. The impalas came in first. Getting closer.. and closer... then so did the zebra. An impala ewe walked by my shooting lane - no more then five yards away. Suddenly, a small yearling came in after her, stopped, and stared right at me. I thought I was busted. The rest of the herd stayed just off to the right of my shooting lane. I thought about the impala which were coming into range, but it was looking like the zebra were heading in too! At that point I set my eyes on the zebra. As they got closer I picked up my Bowtech Old Glory. The first one was a Stallion - it was within range but since he was quartering-to I did not shoot. The second zebra was broadside, and in range, but it was a pregnant mare, so again - no shot. The third and the fourth were broadside but they were both neck and neck and a pass-through could wound the 2nd. But then, they separated and I drew back my bow. I lined up the pin and RELEASED! 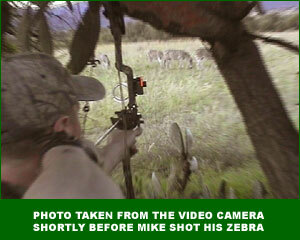 I hit the zebra a foot behind the right front leg (good shot for a deer, but a bit further back for a zebra). The zebra and impala took off on a full run.Chris and Weihan picked me up and we started tracking. I pointed out were I hit the zebra, and the direction I last saw it running. Despite our efforts, we were unable to find it before nightfall. Not wanting to to push the animal, we called off the search temporarily and would pick it up after dinner. It was hard to eat. Chris, Wiehan and myself went out to search again. Chris was hoping to find the herd of four. He thought they may possibly lead us to my downed zebra. After a while we found the four zebra, but no sign of the fifth. We called it a night and would look in the morning. On our way back to camp we saw something laying in the dirt road. Wouldn’t you know, laying right in the middle of the road was number five! It couldn’t have been anymore perfect at that moment. The shot of the arrow was exactly as I had called it. What a night. I couldn’t believe my luck today. It was absolutely fantastic! Tuesday sent us to the ground blind which is now named: "Nicks Passion" (so named for this mornings hunt). The wind was changing all morning but we did have one extremely nervous impala come into the hide. The impala walked the perimeter in the front of the blind - never closing the 30 yard marker. At the point where the animal was directly in front of the hide, the opportunity for a broadside shot presented itself. I drew my bow and set the animal's vitals on my 30 yard pin. I heard Chris' voice in the back of my head "straight up the front leg, 1/3 into the body". This was a very different mindset from our animals back home. Hearing the release, the impala dropped down to make a quick exit. That drop with my poor job of range estimation (was actually 22 yards) sent my arrow sailing over his back. About a 1/2 hour later I saw several impala on the right side of the blind. They moved in and grazed on some of the shorter grass. 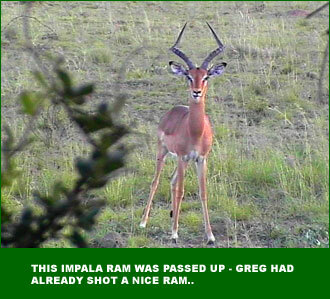 I picked the larger impala and waited for him to present a shot. He stopped at the mineral lick, then continued right until he stopped to scratch his hear, 18-20 yards out. The time was now, he was totally unaware of us. I drew my 60lb Bowtech Mighty Might (which now seemed like 100 lbs.) and couldn't believe how nervous I had become. But once drawn, I settled in on his vitals and waited for him to drop his hoof - or at least that's what I thought I did. I released, and knew it was a great shot (come to find out later when reviewing the film that I shot right between his antlers). I was so focused on his vitals that I hadn't even noticed his horns bracketing the kill zone. Nick quickly sprang to his feet and we both watched the impala jump up in the air, then fall. This felt great. 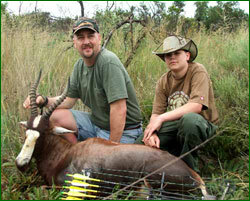 Not only was I able to take an animal in Africa, but to have my son Nick with me was every bowhunting father's dream. Our private jubilation sent us in the clouds for the rest of the day. We sat a small patch of trees in the middle of the main field only to watch blesbok, red hartebeest and impala from a distance. Nothing close, no shots. This was now day three. I returned to the same clump of trees as yesterday. I didn’t have to wait very long before a group of blesbok came into view. One of them was walking with a limp. I drew back the bow, lined up the pin and RELEASED! 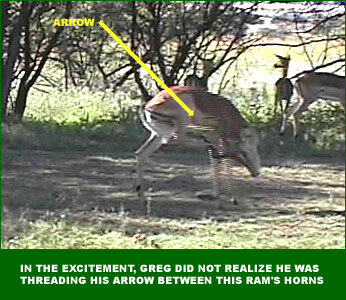 I didn’t see the arrow hit, however, I saw the blesbok bronco kick with it’s hind legs. At first I didn’t know what to make of the shot. It settled for a minute or so at the field’s tree line. Then, along with the others, ran off. I walked out of the hide to find the arrow and see if it could tell me where I hit him. Not good, it was a gut shot. I radioed Chris and we all decided it was best to give it time. We knew the direction it had headed. Just then, Greg's son Nick radioed us. Three blesbok had come into his set up. 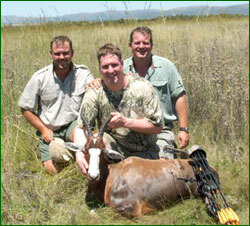 Sure enough it was the same blesbok After a while of not pushing the animal, it gave up. What a nice buck. I returned to hunting by the late afternoon. I decided to try Nick’s Passion Pit. I waited there until dusk. Nothing came into the area. Our strategy of going to the animals is correct. Perhaps tree clumps, or similar natural hides may be best in the green season. I need to celebrate again this evening at camp. I’m having the time of my life and I still have three more days to go! Wednesday morning we sat the tree hide glassing and watching wildebeest across the field, again nothing close. We fabicricated a few new blinds next to trail crossings and natural funnels. We attempted to do some 'nudges' and drives in an attempt to push animals but it was unproductive. They were on to us. As we were driving around the low side of the mountain I spotted a wildebeest hanging in the shadows of a large tree. I told Wiehan to slow down and then continue driving while I jumped from the Land Cruiser. The wind was in my face so I picked a stalking path towards the animal. The wildebeest were paying close attention to the Land Cruiser. which was now driving around the back side of the hill. I was able to close within 25 yards. It was quite the adrenaline rush. I could see that its horns, and just at the edge of his ears. Then I realized, crap this is a cow. Although Chris and Wiehan said it was okay to shoot a cow I wanted a bull. Not wanting to miss the chance see how close I could get I continued on. At 20 yards the animal bedded down. At 18 yards the animal stood up. What a shot! She was quartering away, and a nice sized wildebeest. I drew my bow on the animal and picked a spot - just to see how it would react. Just as I let down my bow, the cows' bigger brother stood up next to her. They both took off up the mountain. Wiehan informed me later that they were two bachelor bulls, the smaller one being a young bull. Guess I should have taken the shot. I love bow hunting, gasp. The mornings here are spectacular. I decided to hunt 'Nick’s Passion Pit' again. Perhaps the morning may show more activity. A herd of blue wildebeest came down the road but none within range. There must have been twenty of them - about thirty yards out to the right of the hide. I thought for a minute about stalking, but knew I'd be detected before ever getting out of the hide. They passed, and that was the only activity this morning. Later I returned to my zebra blind. I thought the herds of impala, blesbok and red hartebeest would come in closer but no such luck. A Jackal ran nearby and spooked everything out of the area. I moved to a clump of trees in the middle of a different field. This was the tree clump where the blue wildebeest shaded themselves from the mid-day sun. I was well hidden and there was a lot of room to move around. The leaves helped to camouflage our movement. Somehow I had a good feeling they would be back this afternoon. I was right! A blesbok, two male red hartebeests, and a large herd of blue wildebeest came into view. The red hartebeest looked great. The only problem was the blesbok was closest to me. If I had moved on the hartebeest, the blesbok would have spotted me. So I patiently waited for the wildebeest to come closer. The first one came within shooting range - about twenty-six yards - but I wasn’t set up to draw. But I was ready when the second one came into my shooting lane and stopped. It was young, so I passed. The third one walked passed the second one. I drew back the bow, lined up the pin and followed it in full draw until he stopped, I RELEASED the bow! Yes! a hit! The animal was bucking a lot. I was excited. He quickly joined the herd and ran a very short distance before snorting back at us - angrily. Wiehan came in and got me. We tracked the wildebeest a bit but the trail was hard to follow. Night fall came quick, we'd pick it up tomorrow. On Thursday we hunted one of the hides we had fabricated the previous day but saw nothing. We also had a great stalk on a small herd of wildebeest but as we closed in on the herd (using a nicely wooded area for cover) 35-40 wildebeest blew out of the forest. It amazes me that whether they are with their own kind, or teamed up with other critters (like those damned zebra) they assist each other in acting as sentries. It also amazes me that these animals, as big as they are, can hide in their surroundings and never be seen. They have great natural camouflage. For the evening hunt I sat another ground blind in the middle of 'back' field. Everyone has walkie talkies and it is quite humorous to listen to the banter that goes on behind the scenes. Nick had several guinea fowl come into his blind and asked me for the green light to take one. I gave him the go ahead and within seconds he was back on the talkie exclaiming he had shot one - it was floundering around with an arrow in it. I told him to go wring its neck but he was a concerned that the bird might peck him. I then told him to put another arrow into the bird and the next thing I heard over the airwaves was "I spined him, he's dead". I was very proud of him, his first animal and it was in Africa. When we returned to camp we hung the guinea fowl off of the same hoist the rest of the animals get skinned from and took pictures. A trophy is a trophy, regardless of the size. First thing in the AM, Chris, Wiehan and I began tracking my wildebeest. It had rained last night so what spore we had was now gone. We found the arrow. It had made great penetration but was now laying on the ground, fully intact. I could tell upon examination how far it went in. Some fat and muscle tissue were on it, despite the rain. The arrow was about three quarters of the way in the animal and when it was bucking, and dislodged it. With no blood or ability to track prints, it wasn't looking good. 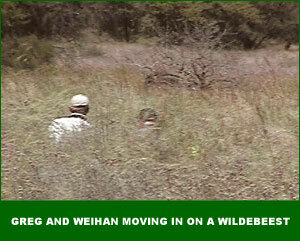 Chris and Weihan thought it would be best to try to find the herd and hopefully lead us to the downed wildebeest. It took us all day, but we were able to locate them and there he was. What a spectacular animal! It was now dark as we brought it back to camp. We broke open a bottle of champagne! Wiehan and I named the wildebeest hide "Midnight Mike." The name is fitting - seeing how I do my best work at dusk. Life is good. Three animals in five days, not bad at all. Friday started late. Not sleeping much had finally caught up with me and we inadvertently slept in. Ten o'clock in the morning? Holy cow! Not wanting to miss anything and pushing ourselves had taken its toll. We decided to go to separate stands but no animals came into range. Friday afternoon was met with the typical afternoon thunderstorm - only this time it was not far off in the distance. The skies turned black and we counted the thunder. Seven miles, no rain and impala 50 yards away. Six miles, no rain and impala 60 yards away. Five miles, no rain and impala moving further away. Four miles, rain starting slowly and impala still moving further away. Three, two and then one mile quickly advanced. Suddenly the rain was pounding us. Chris and Wiehan zipped by to pick us up and during the short ride to camp we were drenched from head to toe. We laughed the entire ride. I did sit in a blind on Saturday. A red hartebeest came into view with another one following it. They were on the other side of the tree line that ran in front of the hide. They were approximately forty yards out and nervous as they continued to walk on past. That was all the action I saw this morning. I drew my hunting to a close. Sherri and I decided to walk back to camp and enjoy the last moments of our Safari. I had the adventure of a lifetime. It was a great experience hunting the green season. As long as one is up for the challenge of going to the animals, you will more than likely get game. 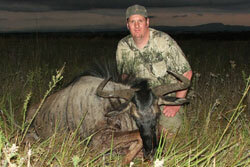 Thinking outside the box and really being open the new ideas is what made my hunt in South Africa successful. I have to thank Chris and Wiehan for the hunt of my dreams. It was the best hunting I have every had. The staff at the concession were fabulous and made our stay enjoyable. It was a pleasure to visit here and I highly recommend Buchholz Safaries to any bowhunter looking for a South African Safari. Saturday morning, last day, last hurrah. The pressure had been off since Tuesday's impala. We drove the mountain, thinking that Nick would be perfect in the lower mountain hide. As the Land Cruiser. approached the hide we spooked 5 impala that had been feeding there. Nick was excited and jumped from the Cruiser with his bow. Leaving Nick, our plan was to set me up in a ground blind at the rear of the property. Chris and Wiehan would then move through the lower section. The plan was perfect except the wildebeest, zebra and blesbok had moved up the field and took a path away from me. I could only hear (and feel) them running from my position. Chris radioed and said they were going to check on Nick - and possibly move the animals back toward me. The wind was perfect and the animals were slowly running in my direction. The one unfortunate path they took was rounding a large bush and then up the middle of the field. My presence was unnoticed the entire time they were moving. I buried myself in a Silver Bush using my Camo sweatshirt for additional cover. Quickly I stomped down the grasses and eliminated any branches I might step on. I kneeled down and waited for Chris and Wiehan to move to the other side of the mountain. Hearing some movement in front of me, I spied through a hole in the bush and counted 3, no 4 blesbok With no hesitation I sized up the animals and found the first to be the largest. I let it pass about 16 yards to my left and get quartering away. While drawing my bow I picked a spot and let the arrow fly. The shot was smooth. It hit right where I wanted it. 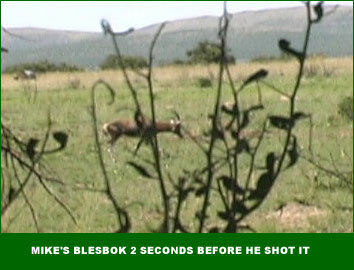 I watched the blesbok stagger, then run 40 yards where it disappeared in the tall grass. It was down. Two nice shots with two animals down within sight from the hide. This was more than any hunter could ask for. Nick radioed me at this point and informed me that he had also taken a shot on a Ewe impala. He was "out of his skin" excited. We found that the hit was a pass through and a little high. Wiehan was able to track the spoor and locate the animal. His abilities of tracking were phenomenal as he had learned from several of the native people, including John who was the resident tracker on the concession. This was just the perfect end to our bowhunt! I can't say that the hunting we did was easy but it was the most fun I have had in a long, long time. And when I think back to this hunt years from now I'll be satisfied knowing that it was quite a challenge. I can't thank Buchholz Safaris enough for providing me and my son Nick an experience we will cherish forever.